Classic Venetian cuisine just steps from San Marco overlooking the lagoon. 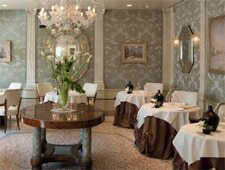 : Do Leoni at Hotel Londra Palace is close to San Marco and overlooks the lagoon. Chef Loris Indri’s Venetian menu offers attractive compositions, like “Flavours of Venice,” to give diners a sampling of typical heritage dishes, such as baccala (dried salt cod), black squid risotto, and a mixed grill of seafood. Alternatively, you may want to choose an à la carte item, perhaps a breast of pheasant with smoked potatoes mousse, a honey and orange glaze and smoked sea salt flakes from Quercia. Vegetarians are well served with seasonal selections: summer pumpkin soup with black rice and artichokes. Dessert brings an assortment of soufflés and homemade ice cream options. Maître-sommelier Samuel Basto’s Champagne and wine list is a collection of (mainly Italian) labels with something for everyone’s taste.